When Snuffy came to DAP she was a very scared and timid little girl, but after living in a calm home environment for a month or more she is now more confident, playful and having cuddles with her favourite foster carer is top of the list. Snuffy is having a great life with regular visits from children, going out on walks and snuggling up with her foster carers special dog Stan, they are besties. We noticed very quickly that Snuffy had one sore eye and appeared to be blind in that eye, so after a quick trip to our favourite ophthalmologist Dr Mark Bilson at SASH testing was done and Mark advised us to have her sore/blind eye removed as there is no surgery that can be done to give Snuffy back her sight and as the eye was uncomfortable there was no point in keeping it. Snuffy had that eye removed and recovered well. Upon examination Dr Mark also noticed that Snuffy’s other eye was not looking good either so a quick ultrasound was done and she has been diagnosed with a condition called Ocular Melanosis. Unfortunately Snuffy will also go blind in her remaining eye, we are however using Predniferine and Cosopt drops twice a day to help keep her eye healthy for as long as possible. Snuffy’s special order for a new home will be with a family who have a lot of love to give a special little dog like her. Snuffy navigates her way around my home easily going in and out of the doggie door, chasing birds from the garden, playing with my grandchildren and hanging with the other dogs. We would love to see Snuffy go to a similar environment or one with a retired couple who will look after Snuffy as she deserves for the rest of her life. Snuffy does not like cats at all so a home without felines is going to be more peaceful for all concerned. 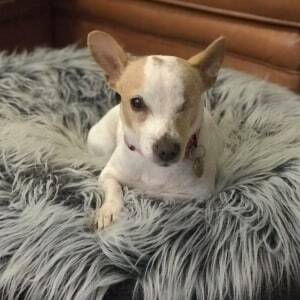 Snuffy is a house dog, she loves a very soft and comfy bed for sleeping or she will curl up with you on the couch. She enjoys being able to access the garden whenever she feels like it and is completely house trained if she is able to go outside easily. Snuffy is a great eater and an all round amazing little dog. Snuffy has a short coat that does shed just a little, her coat is low maintenance requiring a quick bath and brush. Monroe is a lovely gentle girl. She is very playful, active, great with children and walks beautifully on lead. Monroe enjoys car rides and jumps into her foster carers car whenever there is an opportunity. She gets along very well with the other dogs in her foster home but does prefer getting buckets of love from her human. Monroe will fit into family life providing her new family do not go out day in day out and leave her alone. She was surrendered along with two other dogs and did grieve for them for a period of time, she has now adjusted to her new life and in a nutshell Monroe is a very happy little dog these days. Monroe does suffer with dry eye and requires Tacrolimus ointment in her eyes twice a day to keep them moist and comfortable. Tacrolimus is not an expensive eye cream costing anything between $50 and $100 every six months, she will require eye drops for the rest of her life. Monroe has a non-shedding coat that will grow and require ongoing grooming, also doggie door or an open is needed so that she can go in and out to toilet. Monroe is house dog preferring life on the couch to a kennel outside any day! Merlin was surrendered to DAP by his owner as she is unwell and can no longer take care of him. 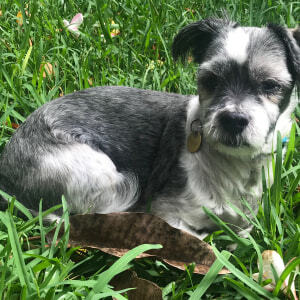 Merlin is now with one of our amazing foster carers on the central coast, he is loving life with his new foster family because he has the company of 3 dogs, a bird or two and his foster Mum who is at home with Merlin and the gang most of the time. 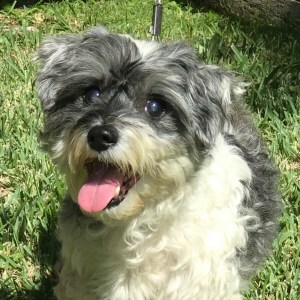 Merlin is approximately 11 years old and is vision impaired, but that doesn’t stop him from his enjoying life at all. His foster Mum is very clever and has been making him toys and things to play with that contain bells, he can’t see them very well but he can certainly hear the noise that they make. Merlin follows his doggie friends in and out of the doggie door, he sleeps on his foster Mums bed and he is a very happy chappy. His coat is glorious, lush, thick, shiny and does require grooming to keep him free from knots. Merlin has been to see Ophthalmologist Dr. Kate at the Small Animal Specialist Hospital, unfortunately there is no surgery that can be done to give him back his sight. Merlin was out of sorts for a day or two when he first went into foster care but quickly worked out where everything is and with all of the love and kindness shown to him by his foster carer Merlin feels safe and secure once again. I visited Merlin on the weekend and he greeted me at the door with his tail wagging and giving little barks, he is certainly very happy these days. Merlin will suit a home with another dog for company, or with a retired couple/single who have all the time in the world for him. He is an inside dog requiring access via a doggie door. Potato and 2 of his siblings were surrendered to our organisation by their family. Potato’s foster carer has nothing but kind words to say about him. His carer has said the Potato is a lovely little dog who behaves like a puppy not a dog of 13 years, she cannot believe that he is 13. Potato loves to run around the garden playing, he curls up with his foster carers little old dog and hasn’t set a paw wrong. 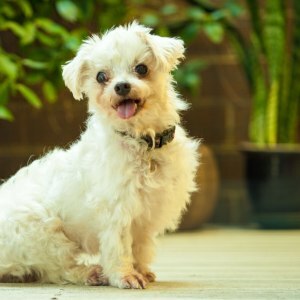 The ideal home for Potato will be with a family who have another old dog for company or a retired couple who would love a little dog to cuddle up with and take on walks each day. He would suit a couple who go caravanning because he is so well behaved. Potato’s coat will grow and require regular brushing and grooming, he is in very good health after having a dental and other vet work needed when he came to us. Potato is a house dog and will require access via a doggie door or similar at all times. dogs and has no known health issues. Sam weighs 8kgs. enable him to be groomed in a normal environment in the future. and trusting relationships we believe that his fear issues will resolve. We would love Sam to stay local in Orange or near by where he is based in foster care. Sam comes desexed, microchipped, fully vaccinated and is on flea, worm and heartworm prevention. The adoption fee is $495. Sam is not available for adoption outside of NSW (Except ACT). If you would like further information on Sam please email Denise. Forrest is a very sweet boy who is trying very hard to forget his past life. When Forrest arrived in our care, he was incredibly timid and would cower and wet himself if you approached him. With time and patience and the help of his foster doggie sisters, he has come ahead in leaps and bounds. Forrest is no longer afraid of the leash, in fact instead of running away from it shaking in fear, he now runs towards the leash. He gets super excited when his foster mum comes home, so much so that she has to avoid patting him until he’s calmed down or he will pee out of sheer excitement. He absolutely loves going for his daily walks, he’s a gem on the leash never pulling and Forrest has finally learnt that walks are for sniffing the grass and peeing on trees! Forrest's past does get in the way sometimes and if he is feeling anxious, he will express himself by vocalizing, something we’re teaching him not to do by ignoring him and walking away from him. We think Forrest would be best suited to a quiet home, with a kind, experienced and patient family who are willing to accept him and all of his quirks. Forrest's new family must continue to work with him towards a lighter, brighter future. Forrest is a sensitive boy and it is imperative that he goes to a family who will give him the time he needs to adjust to his new life. A family that will use positive reinforcement to continue his training is very important, he is far more receptive to kindness and being shown what to do. 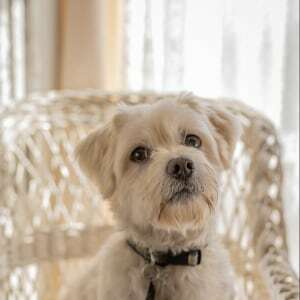 Forrest must have access inside his home at his leisure, he has a short, shedding coat that is low maintenance and only requires the occasional brush and bath. 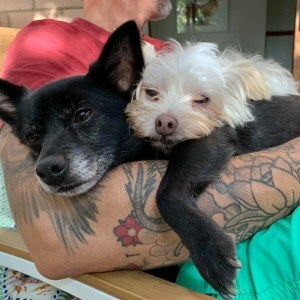 Danny Boy is a tiny dog with a big personality, having come from a very neglectful past, Danny is now on the road to recovery and has something to prove! 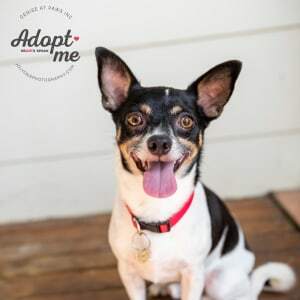 Danny is cute as a button, he loves a good little snuggle on the couch and loves to get out for a daily stroll around the neighbourhood. He walks a bit funky but after vet investigation this does not cause him pain and is something he has probably had since birth. When Danny first arrived his eyes were is a shocking state, they had hair growing into the corneas and he had chronic dry eye which was left untreated but they have been improving with treatment, he will however require life long eye drops to ensure that he remains comfortable. Danny was previously left outside so after 13 years, his housetraining is progressing a little slowly but with patience and consistency we think he will get there. He has a high maintenance coat that will require regular grooming to keep him looking fresh and fab! Danny’s ideal home would be as a single dog where he gets a bucket load of love and attention, he would also be okay with a chilled out female dog. He is great with dogs out and about, usually having a sniff and moving on with his day but can sometimes develop a bit of an attitude towards other dogs he shares a home with. Danny must have access inside, he is probably not suitable to a family with young children but teens are okay. 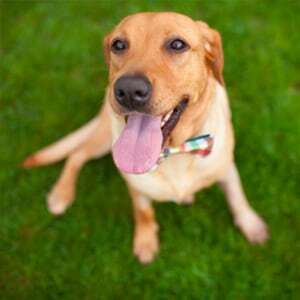 Snickers is a very pretty Labrador mix. 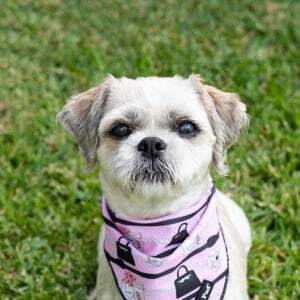 When Snickers came to us, she had a broken front leg that required surgery. Now, she has well and truly recovered from surgery to correct the break and is out and about walking with her foster family and their dogs. Snickers did initially suffer with separation anxiety and she was unsure of the dogs in her foster home. However, after a lot of hard work, time & effort, she has improved and now loves to mingle with her entire foster family. We feel that the best home for Snickers will be with a family who are home more often than not, or can take her to their place of work as she does like to be with her humans. Another dog in the family would be a good thing providing it is not too bouncy and in her face. A nice calm dog would be best for Snickers. She currently lives with another female Labrador who is her bestie. Snickers has a coat that will require regular brushing to keep the shedding to a minimum. She is a house dog and requires access via a doggie door or similar. She loves her daily walks, and now that Snickers’s leg has completely healed, she’s ready to run, swim and enjoy her life like any other dog. Snickers would like to be rehomed with another doggie friend ! !